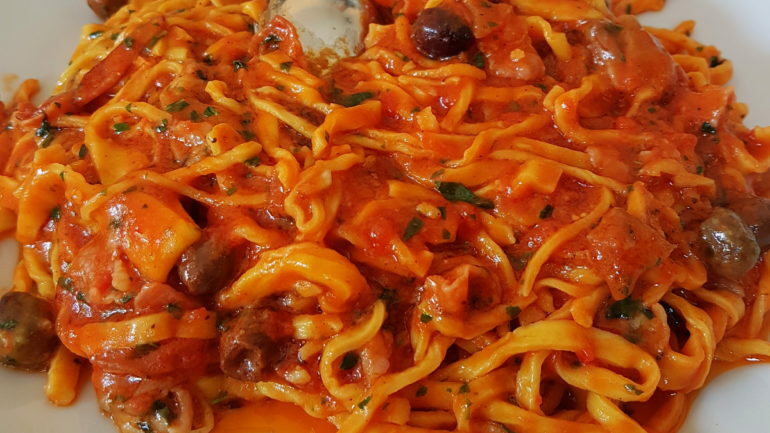 The recipe for ‘alla mediterranea’ with this post is based on a pasta dish we ate last Sunday at my husband’s niece’s confirmation lunch. A big family occasion with 26 people round the table at a restaurant in the countryside near Rimini,Emilia-Romagna, where my sister-in-law and her family live. 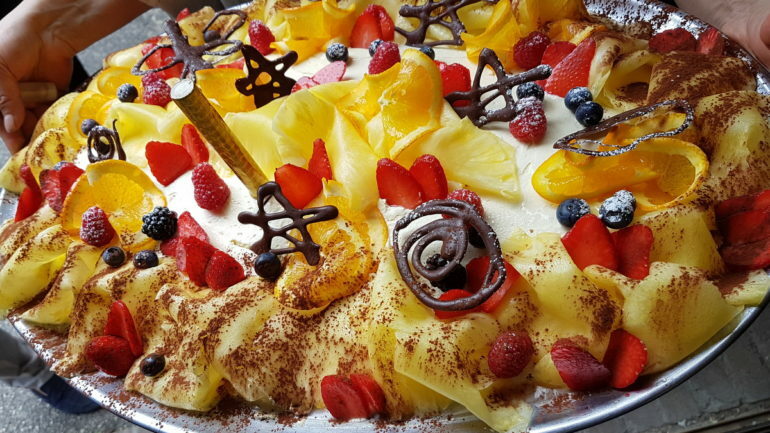 When Italians celebrate special occasions they do so, almost without exception, with vast amounts of usually delicious food accompanied by lots of animated conversation! Because the meal was so good I decided to share pictures of the various dishes with you, not just the pasta! 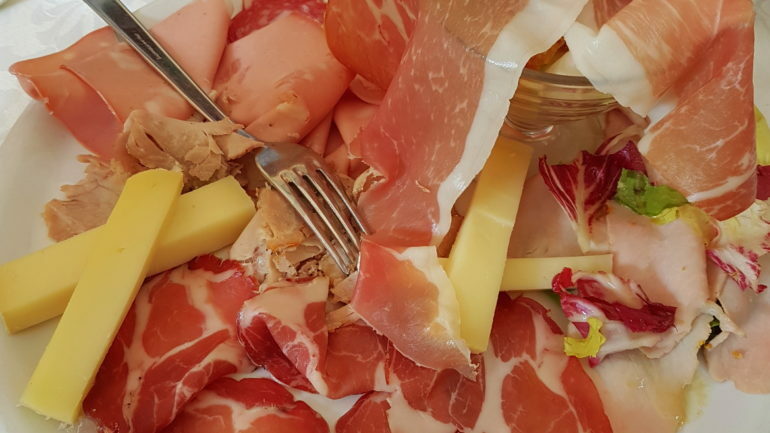 The antipasti included a variety of cold cuts. The normal celebratory meal, be it a wedding, confirmation, anniversary, Christmas etc, includes a lot of courses. 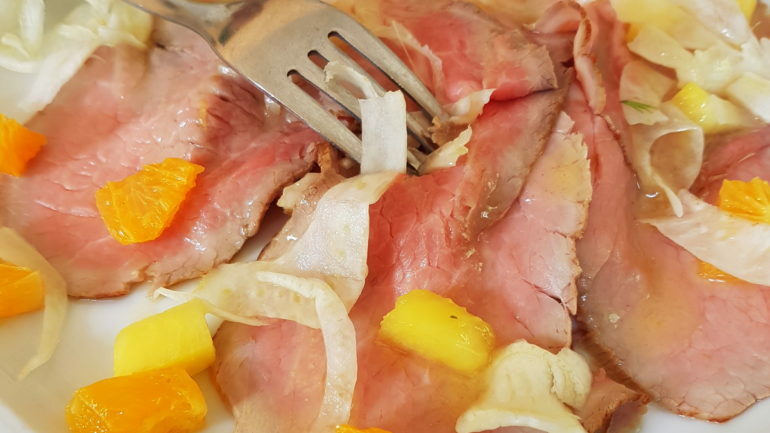 First and foremost the ‘antipasti’ which can be any number of appetizer dishes brought to the table or served as a buffet. 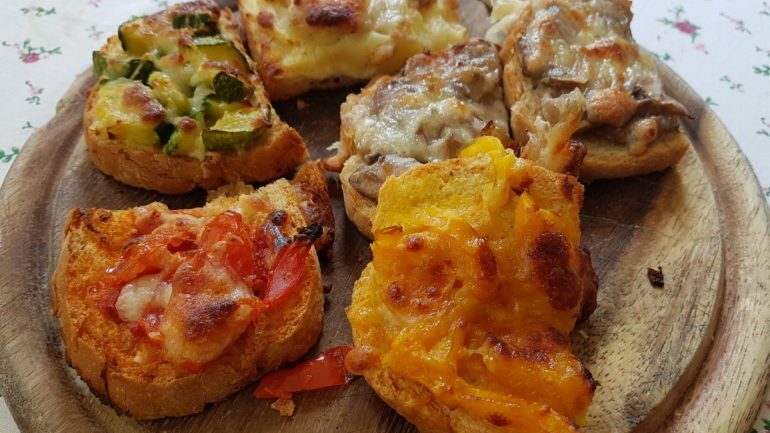 The antipasti are followed by the ‘primi’ or first courses. At a special occasion there are usually 2-3 primi, all pasta or risotto. Here in Northern Italy 2 pasta dishes and one risotto are the norm. In the south it is more likely to be 2-3 pasta dishes. 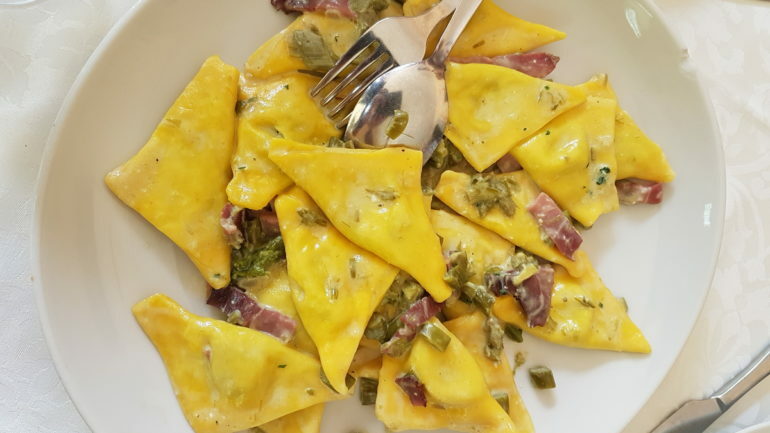 At our lunch on Sunday, which was near Rimini, there were three pasta dishes; tagliolini alla Mediterranea, ravioli with speck and asparagus and pappardelle with ragu! We also had different bruschetta as antipasti! The ‘primi’ are followed by the main course or courses or ‘secondi’ in Italian . 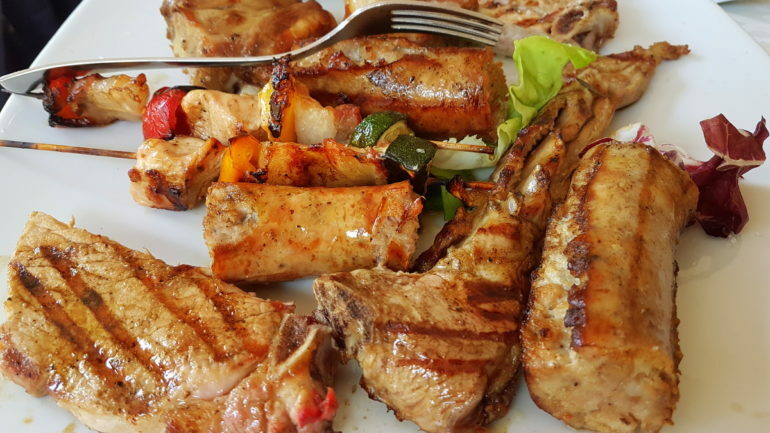 Last Sunday we had two; one chicken and one a mixed meat grill. Sometimes the secondi are one fish and one meat! 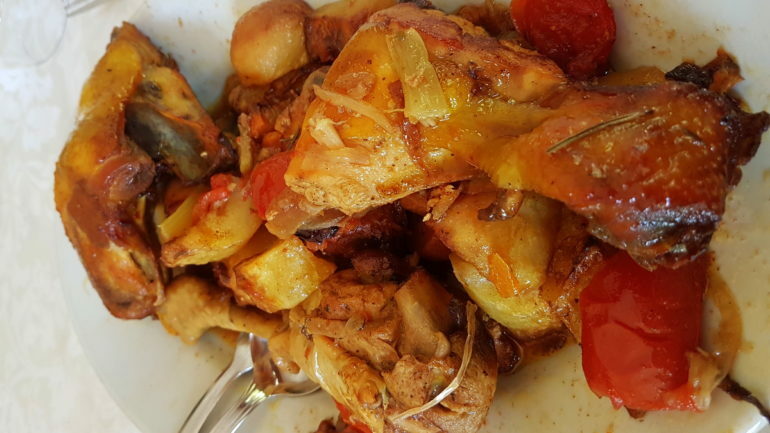 Main courses are usually accompanied by a variety of vegetables and Italian roast potatoes (patate al forno) which are usually oven roasted small potato cubes. Ravioli with speck and asparagus. Sorbet or ‘sorbetto’ is usually served after the main courses to clear the palate and then it’s on to the cheese and/or dessert which often includes a special cake for the occasion. I was quite relieved that we only had a confirmation cake before moving on to coffee and Italian liquors, such as the ever present but always enjoyed limoncello!! As you can imagine after such a veritable feast, it’s pretty hard to get up from the table. Family and guests tend to linger over their liquors. However, eventually (it was about 6pm on Sunday) people start to head home and there’s lots of kissing and promises to see each other soon. This may often mean at the next celebration. Which in our case is a wedding tomorrow! The recipe for this alla Mediterranea sauce on the next page is based on the one we ate on Sunday. 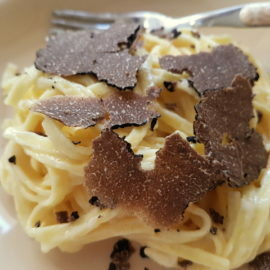 As I enjoyed it so much I went into the kitchen to ask the chef what he had used, so I could share it with you.We had the sauce with tagliolini but it can be served with many other types of pasta. Best are short pasta like penne or fusilli, ribbons like tagliatelle or spaghetti. It can also be used as a sauce for grilled fish or a sauce to cook white fish fillets in. I hope you’ll give it a try and let me know what you think! 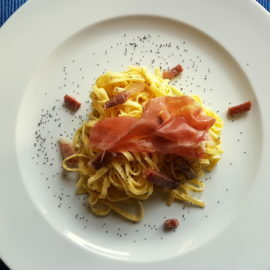 Tagliolini al Prosciutto di San Daniele. 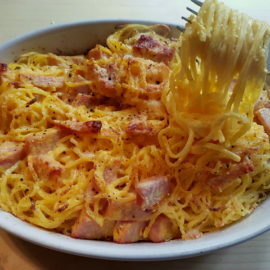 Tagliolini au gratin with ham and cream. 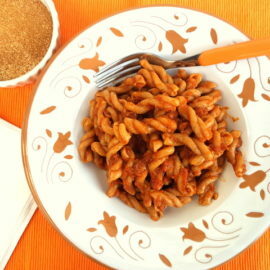 This mediterranean pasta looks so flavorful and delicious. There is a restaurant that used to serve something similar to this but they recently took it off the menu. I can’t wait to make this dish.